Fly fishers out there know the feeling of standing in waders, but unable to reach that spot just a bit too far away. Those who have tried kayaks or canoes know the burden of sitting all day or running aground on a shallow sand bar. 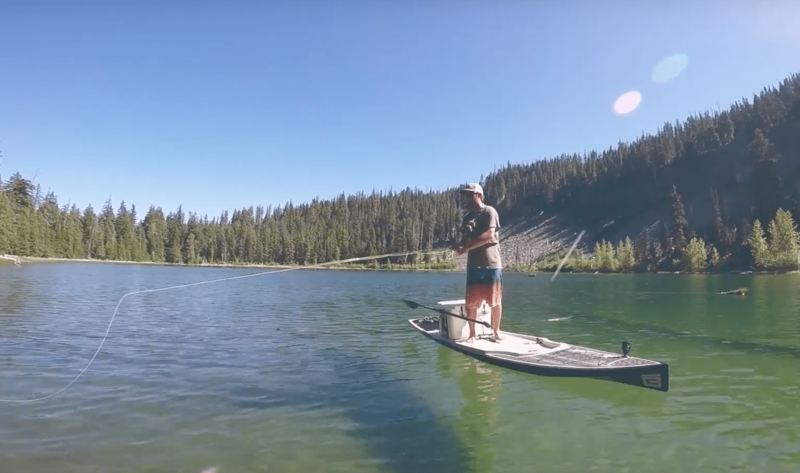 Whether you’re tired of the common hassles of fly fishing or just want to try something new, here are five great reasons you should try fly fishing from a stand-up paddle board. The top reason to ditch the waders or boat and get on a paddle board is the access to better fishing holes. Not only does a paddle board let you go anywhere there’s water, with no limitations on depth, it also allows you access to super shallow areas you could never get to in a canoe. On a stand-up paddle board, you’re able to move up or downstream, and even pick up the board to move to a completely new spot. Boards are usually very wide, so standing on them or casting from them isn’t too difficult. The best part is they will allow you to move where other fishermen cannot. Paddle boards are relatively light and easy to carry on land, so you’ll be able to hop out and trek to the next stream or pond. Paddleboards are also super buoyant and a breeze to maneuver on the water, once you’ve found your balance. Spend a few sessions getting the feel of the board and how to move and balance, then break out the fishing gear and you’ll find that casting isn’t much harder, but now you can do it in dozens of places you could never reach before. Along with the increased mobility of stand up paddle boards is the extra height and visibility they provide. Since you’re free and standing you can see much farther around you, as well as straight down along the edges of the board. This increased angle will allow you to see fish from farther away or even deeper down, depending on water conditions. Compared to standing in waders, fishing from a paddle board gives you a couple more feet in height over the water to see farther out. When compared to kayak or canoe fishing, a paddleboard allows you to stand on top of it providing over three feet of additional height. If you’re interested in seeing more fish in the area around you, a paddle board is the way to go. Along with movement and visibility, a paddle board has one major advantage over traditional watercraft being it’s extremely low profile. Most boards will only hover a few inches over the water’s surface meaning there’s no edge or wall or get caught on when you’re reeling in. This snag free platform is great for any kind of fishing but particularly useful for fly fishing where any obstacle can stop your cast. The freedom of movement you have on a paddle board cannot be rivaled. You’re free to choose between sitting, kneeling, standing, or any other body position you want while on a paddle board. You don’t have to have your legs locked into a kayak and you’ll never get your feet stuck in the mud or sand like when wearing waders. The freedom of movement is perfect while casting out 360 degrees around yourself, or even if you’re taking a break from fishing and just enjoying being out on the water. Aside from the free movement, you can experience while on a stand-up paddleboard, there’s the freedom you have while going to and from your fishing holes. The boards are much easier to transport than kayaks and canoes, so you’re able to choose from more fishing locations that you couldn’t reach with heavier equipment. Even though you’re out to get fish, you can actually get a great workout in when using a stand-up paddleboard. Paddling and balancing on these boards is great for your core, back, and legs. Paddling on a board doesn’t have to be an intense workout, but you can ramp up the effort to match your needs. Just standing on the boards, without paddling, will improve your balance and agility. While out on the water in search of fish, why not get the benefits of a total body workout? Whether you’re interested in increasing your access and potential success while fishing, or just looking for a more comfortable way to enjoy the water, fly fishing from a paddle board may be the perfect combination for you. Try one out at your local fishing spot and you may never go back to waders or canoes ever again.